I won this book from Kelly, over at Kelly's Korner, and since I am trying to read through all the books we owned, I figured, why not! Plus, it had a cool cover. First thing I should tell you is that we aren't planning on starting our family right now. Did you forget we are moving in with our in laws, and then flying to a foreign country? We are wanting to get past this next hump in our life (you know, the unemployed, no home, no concrete idea of where we will be living part) before starting our family. Other than that, we don't have really anything holding us back. 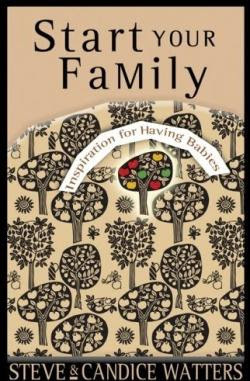 We already know that it is silly (and frankly, unBiblical,) to wait until your whole life is perfectly lined up to have kids, so I was interested to see what this book could add. It was pretty good! Superiorly well researched, it was packed with references to other famous men and women that are worthy of our respect, and was filled with Biblical references on the matter. I feel like it was mostly addressing those who are in their late 20's to their 40's who are still believing they have a long time to "start their family." I would recommend this book to any woman, any age, because it has useful information you can pass on to other people, even if you are not at this stage in your life! It also has several chapters at the end having to do with the family dynamic, which was a good read as well. Cool covers always win me over! The later you have children, the more increased your risk for breast cancer. In fact, your risk starts to increase if you dont have kids by age 20! !